… but not always. QUELONIO (meaning chelonian, if the online dictionary is correct) are from Valencia, Spain. The band was formed in 1997 as a quintet, but in present time only Jose remains from the original lineup. Reading their bio I saw that they have many lineup changes during those years and they have already given many gigs at Spain. Apart from Vicio Y Virtud they have also recorded a demo and a full length album (in 2002). If I understood correctly, Vicio Y Virtud was written before the arrival of Teresa as their vocalist. The album was recorded with their previous singer and Teresa recorded again the vocals in May 2009. As far as music concerns they are playing Heavy/Power Metal with Spanish lyrics, so don't wait from me to tell you what they are talking about. The label of their music looks promising but the fact is that QUELONIO can't filter their influences and at some moments you have the impression that they sew things together without having in mind if these fit together. Here you will find ideas that have been played million of times in the past in a better way from bands like HELLOWEEN, GAMMA RAY, IRON MAIDEN and SYMPHONY X, just to name a few. OK, I know that it is impossible to play something fresh, but please try to filter what you are listening. 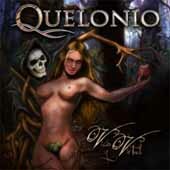 The production is quite good for this kind of music but listening to Vicio Y Virtud the only thing that I want to say is that QUELONIO needs lots of work. Only time will tell. PS: What were they thinking about when they named the band?